One of my husband's absolute favorite dinners is homemade pizza. As a result, I have spent a lot of time trying to create the perfect pizza! Homemade pizza is also a really fun family dinner, especially if everyone can help knead the dough, roll it out, and put on the toppings! You can always do smaller balls of dough so each person can make their own creation, or do a large pizza with a little bit of love from everyone! Set aside a night each week as pizza night-ours is Fridays! We always have pizza and a movie for our Friday night dinner, it's a lot of fun and everyone will look forward to your pizza night! Below I have 5 tips to help you create the perfect pizzas for your family, enjoy! 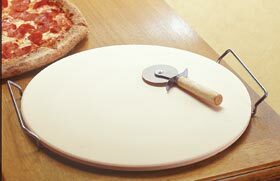 ALWAYS pre-heat your pizza stone before using it so that it absorbs the heat thoroughly. Put your pizza stone in the oven as it pre-heats, and you will be good to go. Some people even prefer to leave their stone in a warm oven for a full hour before putting their pizza on it. If your pizza sticks, then next time you will need to remember to use a little more flour or cornmeal underneath it so that it slides off. For the current "sticky" pizza, use a long piece of dental floss to slide under the dough and release the pizza from the stone. Make sure you only clean the stone once it is cooled-and you don't want to use anything but water on the stone when cleaning it since soap will soak in to it, and soapy flavored pizza is not good! The key to really good pizza dough is cornmeal. The cornmeal is what gives the pizza that little extra crunch, and it will help it come up easier once it's baked. Once you have made your pizza dough (even if it is made in a bread machine), roll it out to the size of pizza that you want. Then, lightly coat it in cornmeal, this will give your crust a delicious texture, a beautiful look, and it will conveniently come off the cooking surface without sticking! All good pizza starts with the dough. I never make pizza dough without putting some of the spices in it; it makes your crust extra special and adds a little zip of flavor. It also makes your crust very delicious to dip in any leftover pizza sauce... I have included a recipe below for great pizza dough, complete with some seasoning suggestions. Once you try your pizza dough with spices baked right in, you won't go back to plain old dough! 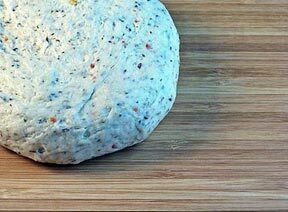 This is a delicious pizza dough that has a nice spicy flavor to it! Yum! 1. Combine 2 cups flour, undissolved yeast, seasonings, and salt in a large bowl. Stir very warm water and olive oil into flour mixture. Stir in enough remaining flour to make soft dough. Knead on lightly floured surface until smooth and elastic, about 4 to 6 minutes. Cover; let rest on floured surface 10 minutes. 2. Lightly oil 1 (14-inch) round pizza pan. Shape dough into smooth ball. Divide and roll dough to fit desired pan. 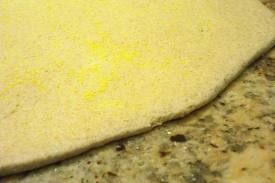 Put cornmeal on your countertop, and lay pizza dough on top to coat the bottom. May sprinkle cornmeal on the top of the crust if desired. A key element to good pizza is a good sauce. I am all about using a prepared sauce-but homemade sauces are delicious as well. 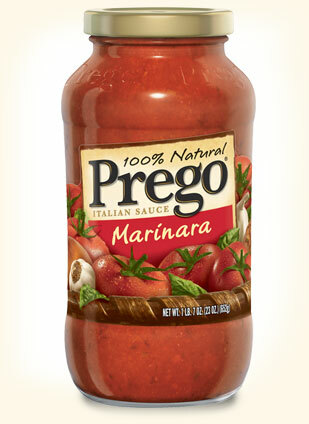 If you are going to use a prepared sauce, I recommend buying one that is an actual marinara sauce, not just a tomato sauce or spaghetti sauce. The marinara is usually a more flavorful option. I like the Prego Marinara sauce, but I do usually add about 1 tablespoon each of basil and oregano, and about 1/2 teaspoon of rosemary to it. In fact, I add spices to any store bought sauce, just to make it a little more "homemade". In the main newsletter, I have included a recipe for a delicious homemade sauce, if you are feeling ambitious! The crowning touch to any pizza is, of course, the toppings! I usually put the meat on first, directly on your sauce. Then cover with a light sprinkling of cheese, followed by the rest of your toppings, followed by lots of cheese! (We use a blend of mozzarella, cheddar, and asiago.) The cheese melts over your toppings, sealing in their flavors during baking, and making it easier to eat afterwards! There are the "traditional" toppings of pepperoni, olives, Canadian bacon, and pineapple etc. that can be used, and there is nothing wrong with them, but creativity with your toppings is part of the fun! I LOVE green chiles, and I add them to about everything I can. (Just ask my husband. Almost every time I try I recipe I say, "This would be really good with green chiles!") Try sprinkling these on your pizza for an extra burst of flavor, and I think you will be hooked! You can even dress up a good old standard pepperoni pizza with green chiles. Try adding a little sauerkraut to your Hawaiian, and try replacing the Canadian bacon with grilled Spam. You can also add finely chopped Macadamia nuts for a little crunch. My sister-in-law likes to put slivered almonds on top of any pizza for crunch, a dose of nutty flavor, and nutrition! One of our favorites is to replace the marinara sauce with hot wing sauce (or you can use mild) and then top with chicken pieces (I just brown the pieces in a frying pan with a touch of olive oil), your choice of cheese, and coarsely chopped celery pieces-right before serving, drizzle a little blue cheese or ranch salad dressing over the pizza. Yum! Don't forget to add some seasonings to the top of your pizza before you bake it. Our favorite one to add is red pepper flakes, but you can also add cayenne powder, oregano, parsley, basil, or rosemary. Just a sprinkle is all it takes! There are lots of interesting combinations to try-the beauty of pizza is that the sky is the limit! If you want to experiment with a few different kinds of flavor combinations-make lots of little mini-pizzas to sample. Then, if something doesn't taste right, you aren't stuck with a huge pizza you won't eat. One big batch of pizza dough can provide lots and lots of little pizzas to play around with-then once you have your perfect signature pizza, you can wow your family and friends with a big one later on! If you want to know how the nutritional value of your pizza changes with your different toppings and sauces-use your Cook'n program to analyze your recipe's nutritional value! That way, you will be sure to know just how well you are feeding your family. Don't have Cook'n? Click here to learn more!